J’s class is learning about volume in math. They’ll be working with cubes, rectangular prisms and possibly cylinders, but that’s all. He asked his teacher if he could work on a “challenge” that has been on his mind, which is to find a formula for the volume of one of his favorite shapes, the dodecahedron. He build a few of these out of paper earlier in the year and really was/is fascinated with them. I think he began this quest to find the volume thinking that it would be pretty much impossible, but he has stuck with it for almost a week now. I am pleased to see that he’s not only sticking with it, but also that he has made a few pretty interesting observations along the way, including coming up with an approach to solving it that involves, as he put it, “breaking it up into equal pieces of some simpler shape and then putting them together.” After trying a few ways to break/slice up the dodecahedron and finding that none of them seemed to make matters simpler, he had an “ah ha” moment in the car and decided that the way to do would be to break it up into 12 “pentagonal pyramids” (that’s what he calls them) that fit together, meeting at the center of rotation of the whole shape. If we can find the volume of one of those things, we’re all set. A few days later, he told me that he realized that “not every pentagonal pyramid could combine to make a dodecahedron” so maybe there was something special about the ones that do, i.e., maybe there is a special relationship between the length of the side of the pentagon and the length of the edge of the pyramid that could be used to form a dodecahedron. He is still sticking with it, and seems to be having a grand time, so I am definitely going to encourage him and puzzle through it with him if he wants. I sneaked a peak on google to see what the formula actually is, and found (as you might know) that it’s pretty complicated. The formula for the volume of the pentagonal pyramid involves (or something horrible like that) and the formula for the volume of a dodecahedron involves or something evil like that. In short, I am doubtful that he will actually be able to solve this problem he’s puzzling through. What does a good teacher do in such a situation? You have a student who is really interested in this problem, but you know that it’s far more likely that he will hit a wall (or many walls) that he really doesn’t have the tools to work through. On the other hand, you really want him to find satisfaction in the process and not measure the joy or the value of the process by whether he ultimately solves it. I certainly don’t care whether he solves it or not. But I want to help him get value out of hitting the wall. How do you strike a balance so that the challenge is the right level of frustrating? When is it good to “give a hint” (you’ve done that for me a few times in what felt like a good way… not too much, but just enough so that the task was possible). In this case, he’s at least trying to answer a question that has an answer. I suppose you could find a student working on a problem that you know has NO known answer, or that has been proven to be unsolvable. Although there, at least, after the student throws up his hands after giving it a good go, you can comfort her by saying, “guess what… you’re in good company!” But here, I’d like to help give him some of the tools he might use to actually make some headway, without giving away the store. I think he’s off to a really good start — learning a lot along the way – getting a lot of out the process, the approach. I can already tell that many of the “ah ha” moments have applicability in all sorts of problems, so that’s wonderful. Wow, okay first of all, I love that you asked me this and it makes me really appreciate your role in this journey J is on, in other words I wish every child had an adult present in their mathematical journey who recognizes the value in their self-driven exploration and is interested in being the guardian of the child’s understanding of that value. Second: no matter what happens, you have access to the “guess what… you’re in good company” response, because the experience of hitting walls as you try to find your way through the maze of the truth is literally the experience of all research mathematicians, nearly all of the time. If by any chance J ends up being a research mathematician, he will spend literally 99% or more of his working life in this state. In fact, I would want to tweak the message a bit; I find the “guess what… you’re in good company” a tad consolation-prize-y (as also expressed by the fact that you described it as a “comfort”). It implies that there was an underlying defeat whose pain this message is designed to ameliorate. I want to encourage you and J both to see this situation as one in which a defeat is not even possible, because the goal is to deepen understanding, and that is definitely happening, regardless of the outcome. The specific question (“what’s the volume of a dodecahedron?”) is a tool that’s being used to give the mind focus and drive in exploring the jungle of mathematical reality, but the real value is the journey, not the answer to the question. The question is just a tool to help the mind focus. In fairness, questing for a goal such as finding the answer to a question and then not meeting the goal is always a little disappointing, and I’m not trying to act like that disappointment can be escaped through some sort of mental jiu-jitsu. What I am trying to say is that it is possible to experience this disappointment as superficial, because the goal-quest is an exciting and focusing activity that expresses your curiosity, but the goal is not the container of the quest’s value. So, that’s what you tell the kid. Way before they hit any walls. More than that, that’s how you should see it, and encourage them to see it that way by modeling. Third. A hard thing about being in J’s position in life (speaking from experience) is that the excitement generated in adults by his mathematical interests and corresponding “advancement” is exciting and heady, but can have the negative impact of encouraging him to see the value of what he’s doing in terms of it making him awesome rather than the exploration itself being the awesome thing, and this puts him in the position where it is possible for an unsuccessful mathematical expedition to be very ego-challenging. This is something that’s been behind a lot of the conversations we’ve had, but I want to highlight it here, to connect the dots in the concrete situation we’re discussing. To the extent that there are adults invested in J’s mathematical precociousness per se, and to the extent that J may experience an unsuccessful quest as a major defeat, these two things are connected. * Hints that are minimally obtrusive allow the learner to preserve their sense of ownership over the final result. The big dangers with a hint are (a) that you steal the opportunity to learn by removing a part of the task that would have been important to the learning experience, and (b) that you steal the experience of success because the learner doesn’t feel like they really did it. These dangers are related but distinct. * How do you give a minimally obtrusive hint? (a) Hints that direct the learner’s attention to a potentially fruitful avenue of thought are superior to hints that are designed to give the learner a new tool. (b) Hints that are designed to facilitate movement in the direction of thought the learner already has going on are generally better than hints that attempt to steer the learner in a completely new direction. Teacher: oh yes, there’s a whole body of techniques for that, it’s called trigonometry. Teacher: It seems like you’re stuck because you know this angle but you don’t know this side. Teacher: What if I told you there was a whole body of techniques for that? Okay, those are my four cents. Keep me posted on this journey, it sounds like a really rich learning experience for J.
Sue’s Book Is Ready for Press and Needs Crowdfunding! 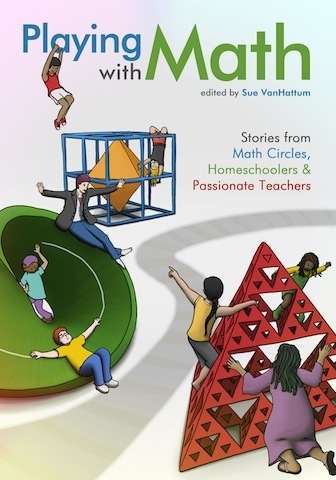 Hey y’all, I am incredibly excited about Sue’s book, Playing With Math: Stories from Math Circles, Homeschoolers, and Passionate Teachers. If you have been around the math education blogosphere for more than a short time, you probably are too. It needs crowdfunding to cover publication costs. I am about to help out and I invite you to do so too!